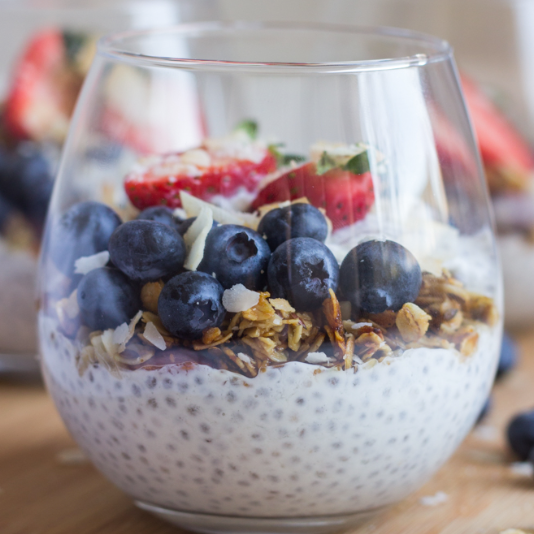 Place all ingredients except the chia seeds in the food processor and blend for 1 minute until all are combined. Taste for seasoning either adding a little more salt or maple syrup. Add the chia seeds to the mixture pulsing 3-4 times until they are incorporated. Pour mixture into a jar or glass container and let set in the fridge for at least 2 hours or overnight. Add coconut to your food processor, cover, and pulse several times to further break up the coconut. Add the remaining ingredients, cover, and run the processor again to mix completely. Scrape down the sides if necessary.Working quickly (coconut oil melts very rapidly in your hands! ), roll the mixture into small balls and place in a dish lined with parchment paper. Better yet, use a small scoop to measure equally sized portions, depositing them directly on the dish.Refrigerate immediately, allowing the macaroons to set up, then cover and store in your fridge or freezer.Makes 10-15 macaroons, depending on size.